With the G5, LG is introducing a paradigm-shifting smartphone ecosystem — the LG Playground. With this, LG aims to strengthen the ties with its partners and introduce various devices and supporting programs to fully maximize the LG Playground. The LG Rolling Bot is a companion device that rolls like a ball while capturing images and videos with its embedded 8MP camera. Not just a toy, the LG Rolling Bot can be used as a monitoring system for the home, pet care companion as well as a remote controller for compatible home appliances. With an IP camera connectable via Wi-Fi, users can remotely monitor the interior of their homes with the LG G5 via live streaming. The LG TONE Platinum (model HBS-1100), the latest in the LG TONE Series, is a Bluetooth headset that has earned the Harman Kardon® Platinum grade for its superior sound quality. With a Balanced Armature design for minimum distortion, LG Tone Platinum delivers exceptionally sharp and clean sound. What’s more, it is the world’s first Bluetooth headset equipped with aptX™ HDcodec, delivering lossless 24-bit audio for sound that is unrivalled in a wireless device. H3 by B&O PLAY is a set of high-end earphones that is compatible with the high-quality sound of the LG Hi-Fi Plus with B&O PLAY. Designed for audiophiles as well as anyone who considers audio performance a top-priority in a smartphone, H3 by B&O PLAY works with all Android smartphones. The LG Smart Controller allows users to easily control certain drones. With the LG Smart Controller, users can check the video stream from the drone through the LG G5 in real time and control the unmanned aircraft with the LG Smart Controller joystick. 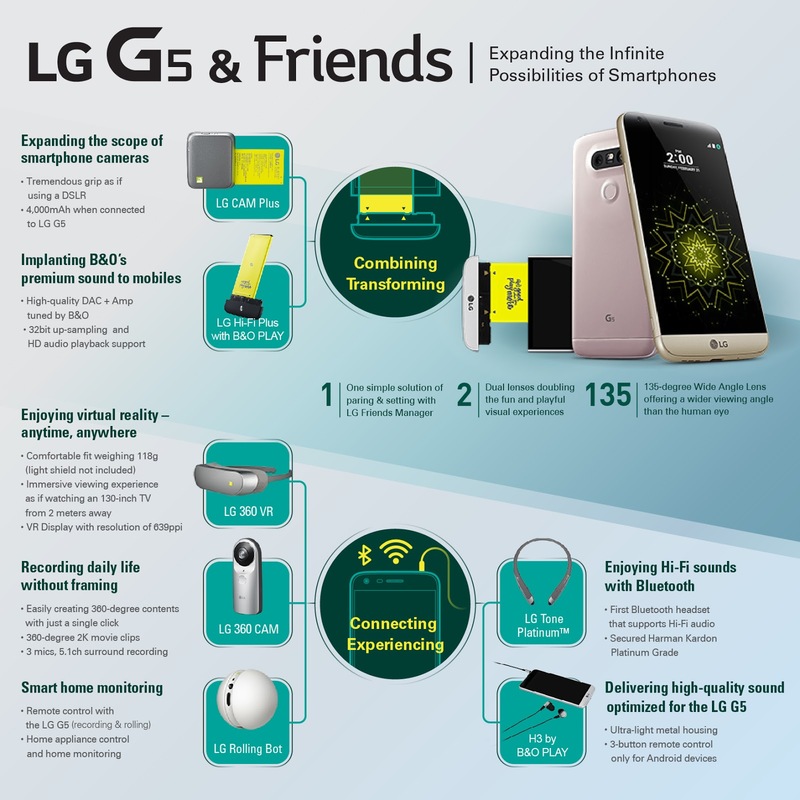 With these amazing companions, the efficiency of LG G5 has increased multiple fold and it will be great to harness the immense potential of the market full of photographers and instagrammers on the go!